40 x 50 Foot Silver Tarp, Heavy-duty, Premium Grade, UV resistant for longer protection. 6 oz per square yard, 14x14 black mesh. 1,200 denier. Price/Each. Silver Tarp, 12 x 25 ft, Heavy Duty UV Grade, 6 oz per square yard, 14x14 weave, 11-12 mils thick, 1200 Denier, Reinforced Corners, Rust Proof Aluminum Grommets every 18 inches. Heavy-duty and UV Treated for longer protection. Price/Each. Silver Tarp, 20 x 100 ft, Heavy Duty UV Grade, 6 oz per square yard, 14x14 weave, 11-12 mils thick, 1200 Denier, Reinforced Corners, Rust Proof Aluminum Grommets every 18 inches. Heavy-duty and UV Treated for longer protection. Price/Each. Silver Tarp, 20 x 20 ft, Heavy Duty UV Grade, 6 oz per square yard, 14x14 black mesh. Heavy-duty and UV Treated for longer protection. 3 Tarps to a Case, Price/Case. Silver Tarp, 20 x 22 ft, Heavy Duty UV Grade, 6 oz per square yard, 14x14 black mesh. Heavy-duty and UV Treated for longer protection. Price/Each. Silver Tarp, 20 x 24 ft, Heavy Duty UV Grade, 6 oz per square yard, 14x14 weave, 11-12 mils thick, 1200 Denier, Reinforced Corners, Rust Proof Aluminum Grommets every 18 inches. Heavy-duty and UV Treated for longer protection. Price/Each. Silver Tarp, 20 x 30 ft, Heavy Duty UV Grade, 6 oz per square yard, 14x14 black mesh. Heavy-duty and UV Treated for longer protection. Price/Each. Silver Tarp, 20 x 40 ft, Heavy Duty UV Grade, 6 oz per square yard, 14x14 mesh. Heavy-duty and UV Treated for longer protection. Price/Each. 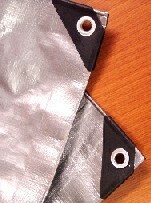 Silver Tarp, 22 x 30 ft, Heavy Duty UV Grade, 6 oz per square yard, 14x14 black mesh. Heavy-duty and UV Treated for longer protection. Price/Each.